Why would anyone in their right mind choose to drive five days and more than 3,000 miles across the country with a complete stranger? I found myself in Anchorage, Alaska during the opening weekend of their week long PRIDE events. 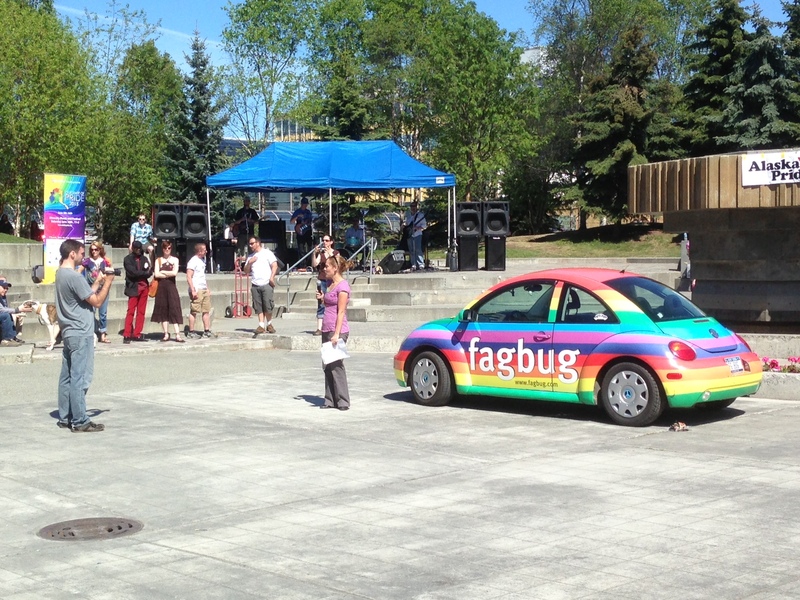 At the opening event, a simple gathering of supporters in a downtown park, Erin Davies, owner and driver of the Fagbug, drove her rainbow car into the center of the park and then made a speech. After driving multiple days and going through an incredible amount of headache to get her little Volkswagon Beatle to Alaska, she shared her story with the crowd. Having introduced myself to her prior to her speech, she had asked for my assistance in filming the event. Her documentary, which tells her whole story much better than I ever could on this blog, is called “Fagbug” and is available on Netflix streaming. Currently, she is shooting the sequel to the film, titled “Fagbug Nation”. As I recorded her words that she was sharing with the tiny crowd of Alaskans, I couldn’t imagine the impact she was about to have on my life. When the event concluded, my friend Matthew and I spent the day with Erin. We walked around the city, ate lunch, and then attended a screening of her movie together later on in the evening. Somewhere along the way, after hearing a few of Erin’s stories, learning about her cause, and getting a few of the details about her endless drive through Canada and Alaska in order to get to Anchorage, I began toying with the idea of traveling back from Washington with her to New York State. Erin happens to be from Syracuse – a mere hour drive from where I grew up. Coincidence? I don’t believe in those! To make a long story short, we worked out the details and the next thing I knew I had purchased a plane ticket and was on my way to Seattle, about to embark on a 3,000 mile drive with a complete stranger. One of the first things that attracted me to Erin was a philosophy that she lives by. “There are only two driving forces in the universe: Fear and Love. And everything we do is driven by one of those two things.” This way of thinking is something that I have taken completely to heart over the years and I was pleasantly surprised to hear that someone else had heard of it too. So, I followed love (not the initial fear driven thoughts like, “oh my gosh, think of ALL the things that could go wrong in this scenario”) and got on the plane. When I was in college, I remember continuing to wrestle with the sadness, confusion and guilt that I felt for being gay. The truth of the matter was, I knew there was nothing wrong with being gay, but I grew up Catholic, and the shame and guilt that came with that kind of upbringing was something that I continued to carry with me. So, even though I wasn’t 100% sure of myself at the time, I decided to force myself to become an activist and I set out to start my University’s first Gay/Straight Alliance, a simple place where students of all orientations could gather and learn to support and care about one another. It was a struggle, the administrators and board of the conservative Catholic school wanted nothing to do with anything gay, but after months of “underground meetings”, a petition, and plenty of new grey hairs, the group came into existence. By the time I was done leading the charge for equality at my college, I had come into my own and had developed a love and understanding for myself that hadn’t existed before. Prior to starting the GSA, my co-founder and I had had a conversation about how neither of us identified with the rainbow. We didn’t take any issue with the fact that the gay community at large uses the rainbow as a symbol, but we just didn’t use it ourselves. After the GSA was official, my thoughts on the rainbow had changed. During our push to create the group, we were able to use the iconic symbol to propel our group into existence. Since then, I’ve grown to love what all of the colors represent – I even own a rainbow flag and rocked rainbow laces on my winter boots the past two winters! After a few intensely “gay years” in college, I’ve taken a more laid back approach the past three years – I have not spent as much of my time dedicated to pushing for equality, but I’ve remained relatively happy with who I am. When I met Erin with her rainbow car in Alaska, I knew I had to take the chance to reintroduce myself into the ways of activism I had grown to love in college. I left my house at 3am on Monday, July 1st and met up with Erin at the airport. From there, we flew across the country in a matter of hours. I knew as I looked down at the vast stretches of land below us that we were experiencing the miracle of crossing the country in a matter of hours – something that we would not be experiencing on the journey home. When we got to the lot where the car had been parked for over a week, the battery was dead, a headlight was out, and the power steering wasn’t working. This was the first time we turned the camera on. Since Erin is continuing to shoot her sequel documentary, the whole drive home we documented the journey. It was easy enough to jump the car and start the journey, but the lack of power steering certainly posed more of a challenge than we had initially hoped. Somehow, we made it all 3,000 miles with no power stirring and only one headlight — and we never got pulled over. 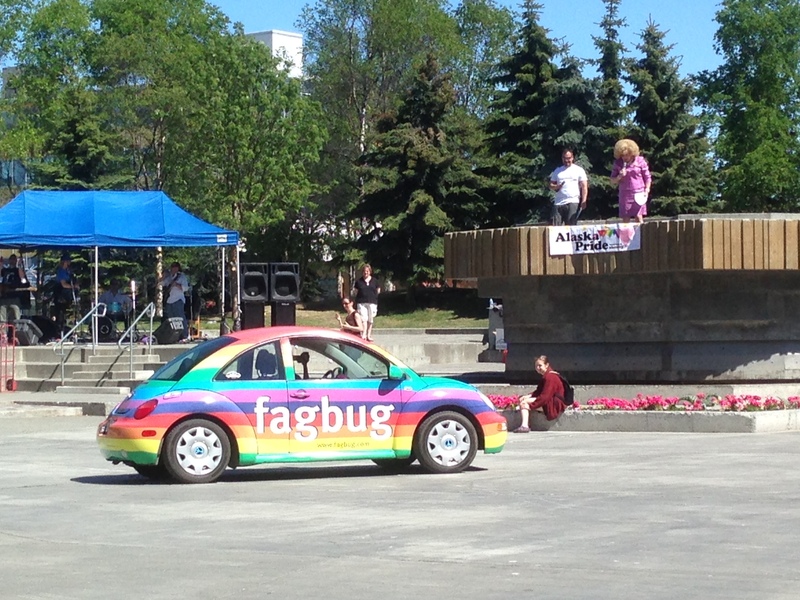 Other than for a few minutes in Anchorage, I had never ridden in the Fagbug before. 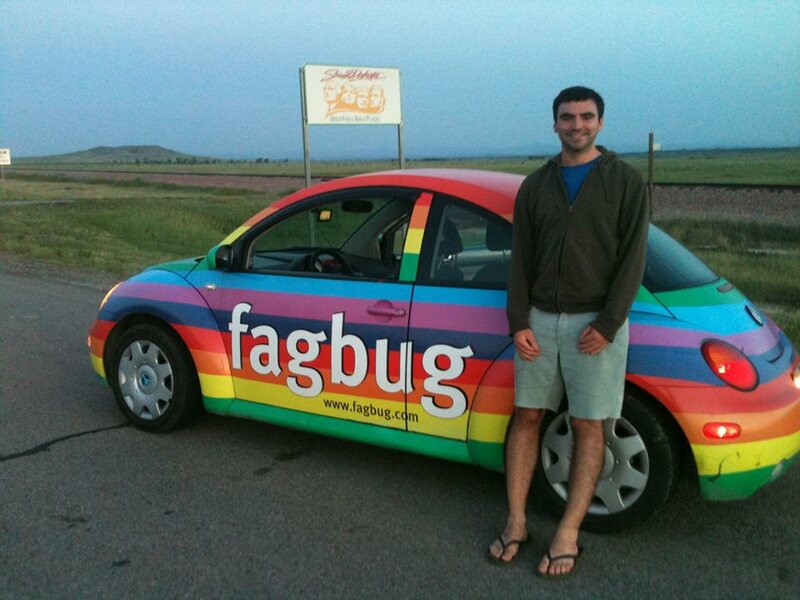 Actually, I don’t think I’ve ever ridden in a vehicle that gets the kind of attention that Fagbug gets. So, traveling through Seattle, I had to quickly become accustomed to the stares. You cant hold it against people, if I saw a rainbow car for the first time, I would totally stare too! The only difficult thing about the stares is trying to decipher whether the person staring is actually happy to see the rainbow car or not! I shook my initial hesitations about being in such an eccentric car as soon as we were out of Seattle and on our way east, heading across the rest of Washington. In a way, it felt as though a huge spotlight was shining down from the sky on top of us the whole way, but again, I got used to it. I quickly realized that the majority of reactions go one of two ways. First, people look at the car in disbelief and give a slight scowl. Second –and this is the majority– people have huge grins plastered across their faces, give thumbs up, scream something in joy, wave, give a fist pump, or honk. Both those who are happy to see the car and those who are appalled by it whip out their cameras and their phones and do their best to get a picture of the vehicle as they drive past. I don’t want to think about how many strangers have my picture now! Along with the lack of power steering and the burnt out headlight, the Fagbug also came with a lack of air conditioning. I didn’t expect this to be an issue in Washington, but I was wrong. The temperature on the stretch of road between Seattle and Spokane (which is basically the entire state) reached a whopping 106 degrees! It was so hot that sticking your hand out the window actually made your skin feel worse as the sun made direct contact with it. Having the windows open the entire ride was a great way to get the trip started though, it made it easier for people to shout things at us and to take our picture. The fun of shooting a documentary is that we got to take their pictures too! Many of the times that cars would try to travel the same speed as us on the highway, I would whip out the video camera and record them as they waved or yelped or screamed “I LOVE IT!” By the time we had made our way across the state of Washington, I was impressed with the amount of support the little car was getting. My partner in crime, Erin, was completely used to all of this stuff that I was experiencing for the first time. Along the way, we made a few pit stops, and while we were either in the bathroom or grabbing a drink at the rest areas, the car was being gawked at and photographed. Erin, being the terrific documentarian that she is, always seized these opportunities to interview the people taking an interest in her car. The point of Fagbug is to be “activism on wheels” but so much of what Fagbug is depends upon Erin being bold enough to ask anyone for an interview. 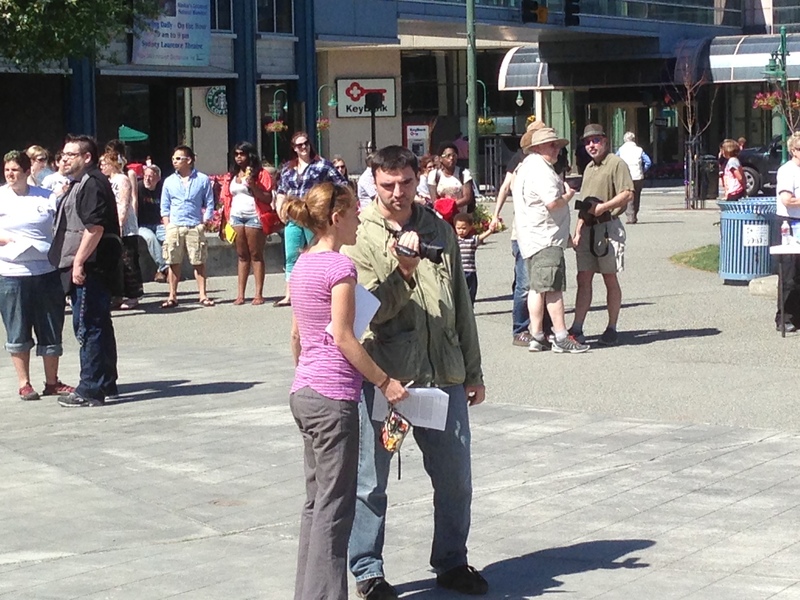 Over the course of our 5 days together, she was able to get interviews with people from all walks of life. I normally just stood behind or beside her and listened intently to the answers people gave to her great questions -what do you think of this car? Would you ever drive a car like this? What are your thoughts on marriage equality? 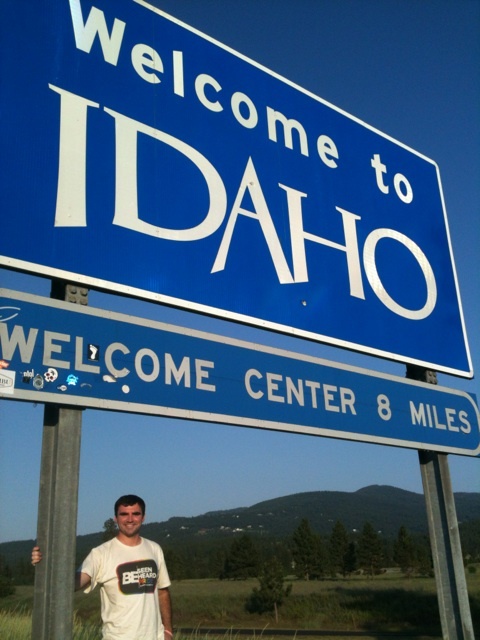 After a day full of driving, we had managed to make our way through all of Washington, the smidge of Idaho we had to pass through, and a piece of western Montana, which left us cruising into Missoula (with our one headlight) at about 10pm. 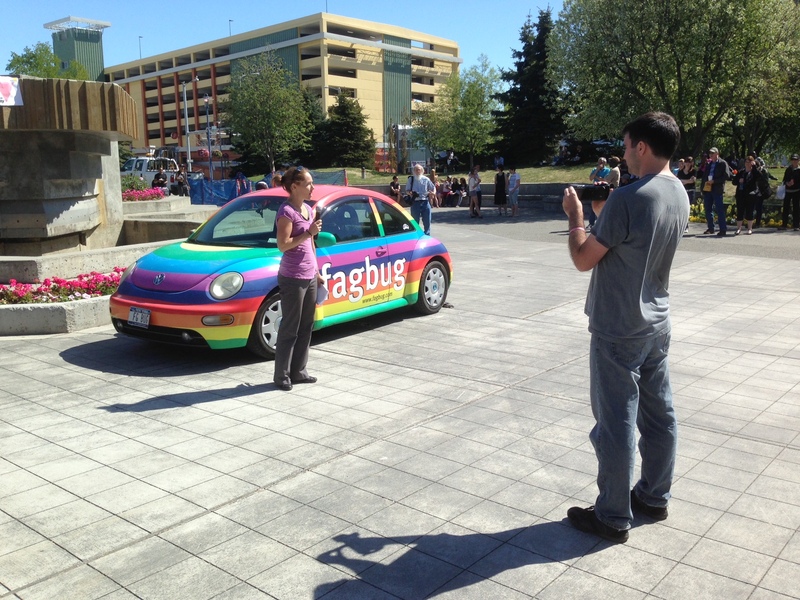 This entry was posted in Gay and tagged Activism, Activist, Alaska, Alaska Pride, Anchorage, Erin Davies, Fagbug, Fagbug movie, Fagbug Nation, Gay, Pride, Rainbow, Rainbow car. Bookmark the permalink. Whoops. I started at the wrong end of the new posts (lol). I had a bug once. It had no AC and the heaters in those things are a joke. I can’t imagine driving without power steering even though when I first got my drivers license there was no such thing. YOu two must have developed some serious arm strength.